In 1960 the canal, as well as the railroad, ran through the middle of town. Gareth Mills dutifully walked its length capturing the forgotten canal just as its grip on urban Swansea was about to be wrenched away. He took quite few of it in Llandore. The viaduct, which still carries the railway into Swansea today, gives us our compass bearings. We are just north of the Liberty Stadium, opened in 2005 for joint use by Swansea City FC and the Ospreys rugby side. The Stadium would be just out of shot on the right of the picture. The supporters now run the gauntlet of traffic on the dual carriageway where the canal once flowed. They rush, post game, for the buses which wait outside Rossi’s chippie which now stands on the extreme left of the picture. The old canal wall on the left is still there and once critical mass is reached by the football or rugby supporters they vault over it and cross the main road ignoring the pedestrian traffic lights. 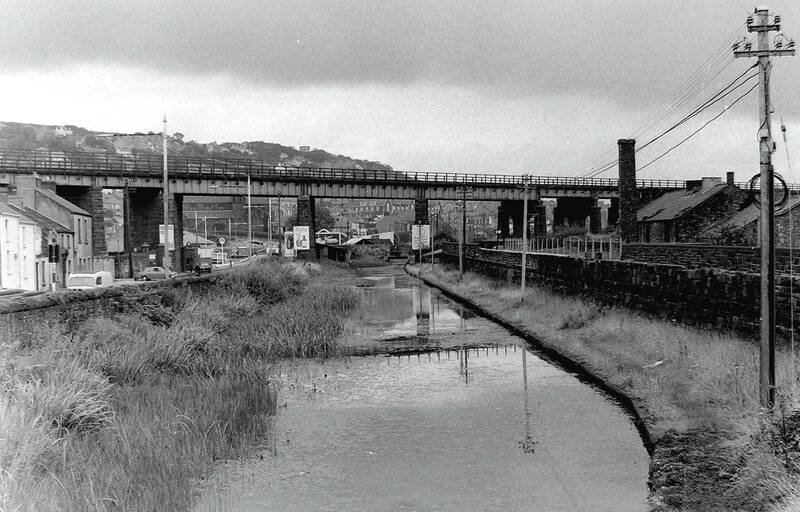 The railway line running north under the viaduct to the immediate right of the canal is making its way up to Morriston, Clydach and beyond. Just as the GWR line brought about the decline of the canal, so too, in its turn, will it shortly become a victim of Beeching’s axe. Road transport will have its way in every sense. Not only will both rail and canal be swallowed up by the dual carriageway but the old main road on the left (seen here with a Swansea bound bus on it under the viaduct arch) will survive the coming upheavals to carry local traffic to this day. One last survivor is framed between the pillars of the viaduct immediately to the left of the canal. No longer open for worship, the grounds of this fine church are now a playground on sunny match days for those who cannot find room in the pub just up the road. Is future is as insecure as Swansea City’s form.